More streets are named after Nelson Mandela in the UK than anywhere in the world outside South Africa. Here is their story. In the south-western corner of Parliament Square, opposite Westminster Abbey, stands a bronze statue of Nelson Mandela. He shares one of London's most high profile public spaces with great figures from British history, such as former prime ministers Winston Churchill and Robert Peel, as well as former South African prime minister Jan Christiaan Smuts. Media captionBrazilian resident on Mandela Square in Brazil: "I am very proud to come here everyday. It’s a very fair tribute"
Mandela, who has died aged 95, is revered by millions of Britons as a symbol of hope and racial reconciliation. But not all of the UK's monuments to the former South African president are quite so grand. If you stray away from the public squares and main thoroughfares, you will occasionally catch a glimpse of Mandela's name on a street sign, in a quiet cul-de-sac on a new housing estate or industrial park. There are more than 25 of them dotted around the country - nearly a third of the world's known total. Image caption Mandela Close, in Brent: The first in the world? Most date back to the 1980s, when naming things after the imprisoned African National Congress (ANC) leader was popular among sections of the UK's left. The modest nature of some of these street sign tributes offer a counterpoint to the lofty, internationalist ideals of the young Labour Party activists who campaigned for them to be erected. Del Boy and Rodney, the perpetually broke heroes of Only Fools and Horses, the most popular sitcom of the era, lived in Nelson Mandela House, a fictional, graffiti-strewn tower block in down-at-heel Peckham, south London. In reality, most addresses with Mandela in the title are on new, showpiece housing developments. This guaranteed that they would meet no resistance from existing tenants, who did not always appreciate having their home address renamed to suit a political agenda. It also sidestepped objections from anyone who believed that Mandela belonged behind bars rather than on a shiny new street sign. The first known example is in the north London suburb of Brent, where the local Labour council unveiled Mandela Close in 1981. "Ethnic heroes are to be commemorated in new street names as a way of reflecting the multi-racial backgrounds of many of Brent's residents," wrote local newspaper the Willesden Chronicle. "Mr Mandela gave permission to use his name from the jail on Robben Island where he is being held." Like most of the Mandela Streets that would follow, Brent had no previous connection to the imprisoned ANC leader, although Paul Boateng, on being elected MP for Brent South in 1987 did famously say: "Today Brent South, tomorrow Soweto." One road with a close link was Mandela Street, in Camden, North London, where the international anti-apartheid movement had its headquarters in the 1980s. Its original name, Selous Street, had been the source of some embarrassment to campaigners as it was thought to be a reference to Frederick Selous, a big game hunter who helped Cecil Rhodes colonise Rhodesia and was a hero to many white South Africans. In fact, the street had been named after Frederick's uncle Henry, a local artist, but the potential confusion was enough to convince Camden council to rename it Mandela Street, instantly creating one of the most iconic, and regularly stolen, street signs in London. In 1984, a year after the renaming ceremony, the South African embassy attempted to persuade Camden to change it back, sending councillors a six-page letter detailing Mandela's "crimes" and seeking a meeting with them. "Camden is always willing to speak with representatives of the oppressed majority in South Africa," Robert Latham. chairman of Camden's race relations committee told the Times. "We don't recognise the current incumbents of South Africa House." Sello Hatang, of South Africa's Nelson Mandela Memory Centre, puts Britain's enthusiasm for Mandela streets down to "the strong anti-apartheid movement in the UK and the way our history is intertwined with yours". "The ANC, as a liberation movement, chose to use Nelson Mandela as a symbol of the resistance against apartheid, as a result of that he became the most famous name to be associated with the anti-apartheid movement," says Hatang. "Countries that wanted to mark their own contribution to the struggle against apartheid wanted to name streets after him. If you name a street after somebody, you are then bound to have people asking questions about it. "They want to know who this person is and what they have done. It is a good way of raising awareness of a cause." The Memory Centre, formerly known as the Mandela Foundation, likes cities to seek permission before using Mandela's name on roads and public buildings. They are encouraged to sign up to a code of conduct, aimed at preventing the commercial exploitation of Mandela's name. The centre has never turned down a request from a city or town - but back in the 1980s local opposition was more of a problem. In 1982, in Cardiff, Labour councillors fought a battle with the Conservative opposition, who wanted streets on a new housing estate to be named in honour of Britain's recent military victory in the Falkland Islands. The developers, Laing, warned that houses on Mandela Avenue, Biko Close and Sharpeville Road might be difficult to sell. In 1987, the residents of Dewsbury, West Yorkshire, and Newport, South Wales, successfully blocked plans to name streets after Mandela. In Grimsby, a Lincolnshire fishing port, council leader Alec Bovill, faced with a growing clamour from Labour colleagues for a Mandela Street of their own, believed he had found the perfect solution. 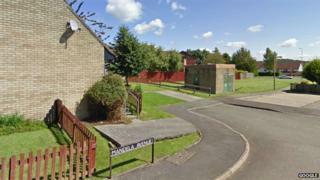 "The controlling Labour group did not want to cause any problems which may have resulted in residents objecting to the proposal of naming a road Mandela Link, so Alec selected this street for one simple reason - there were no residents on this particular road, thus no potential objectors," says Ian Lindley, a member of North-East Lincolnshire council. Image caption Mandela Link, Grimsby: An "insult" to Mandela? "The street remains unoccupied to the present day." But public attitudes towards Mandela have changed enormously since the late 1980s. A 2006 letter to the Grimsby Telegraph describes Mandela Link as "something of an insult to the person commonly regarded as the world's greatest living statesman". Certainly, a drab back street, with no shops or houses on it, linking two unremarkable rows of terraced houses, is not the most spectacular tribute you will find. But there is something unmistakably British about its ordinariness. Like all the other streets named after Mandela, from Falkirk in Scotland to Southampton on the south coast of England, it has become part of the background hum of life in this country, ensuring, as much as any great statue or public monument, that the great anti-apartheid campaigner's name will live on.